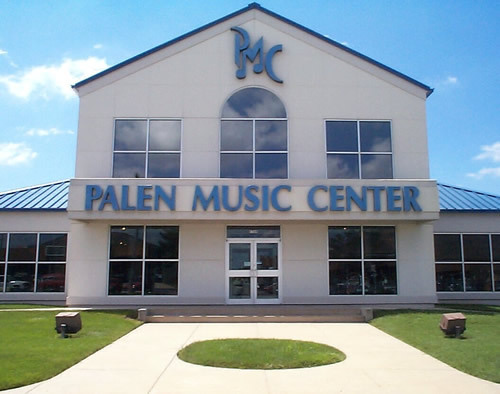 Palen is combining its battle of the bands this year with its annual closed door sale, which offers absolutely insane deals to the customers inside. (Read the most recent comment/review on this page, dated 2/26/08, to get an idea of what you’re in for.) The list of competing bands isn’t finalized yet, and neither is the list of door prizes and other giveaways, but we’ve heard talk of giveaways ranging from music equipment (natch) up to a chance at a new car (whoa). It all goes down March 28 at Palen Music (1560 E. Raynell Place, 417-882-7000) starting at 10 a.m. We’ll fill you in with more when we get it. This entry was posted on March 11, 2009 at 8:00 am and is filed under Looking Ahead, News. You can follow any responses to this entry through the RSS 2.0 feed. You can leave a response, or trackback from your own site. Last year’s BOTB was really cool and a great time. Their closed door sale is always awesome. But a combination? Uber-awesome! Palen is so lame though. There is nothing good about that store. They couldn’t discount things enough to make me want to shop there. I will say that Palen has some good products, but their customer service makes me want to shop elsewhere. I would drive to Lebanon, and go to Morgan Music, if I wanted PRS. They just have rubbed me wrong too many times. honestly, gonna have to agree there. and i’ve been browsing all the stores in this town since ’97. I then pulled out the money, and their story changed. I prefer Hoover and Springfield Music. I just feel like I’m taken care of there. i dont know why this is on here. is palen paying you? No they’re not. Its a business having a battle of the bands. Its post worthy. Maybe one day we’ll make a penny off this site. As of now, grand total made = $0. So, how long has it been since you’ve been in the store? I know there use to be a few idiots that worked there and I didn’t like them either. I think They’re all gone now. The people there, every single one of them, are all more than nice when I walk in the door. Last time I was in there they let me play the nicest PRS they have and I told them I wasn’t even planning on buying it. Springfield Music, Hoover, and Palen are the only true helpful professionals left in town! We have to give these guys credit for being in town for so long. GC and Best Buy are going to turn music stores in to Walmarts basically. Support your local professionals! I’ve never gotten anything but hackneyed BS car salesman tactics when I go in there. The dude sat on the amp, talking to me, moving knobs around – its like, hello, I’m trying out this guitar, I want to see what sounds I can get out of it, not listen to you yap on, watch you stare at me, and get your own stupid sounds out of the amp. Worst store I’ve been in, anywhere. Actually, I’ll bet this has COST you a lot. Kudos guys.